For use on 1968 1969 1970 1971 1972 Chevelle. OEM quality technically correct reproduction cable assembly for restorers and high performance applications. High quality ensures smooth cable operation and eliminates binding and end separation sometimes experienced in lesser quality generic imports. With original appearance tube crimps, shield (casing), fittings, boot and cable links. Cable assembly includes an installed technically correct thru-floor rubber grommet with a heavy spring steel spine insert. Three correct spring steel mounting tabs ensure grommet remains firmly attached to floor, even under the most "active" shifter movements. 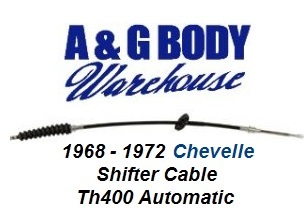 Tighten up your shifting with this new replacement cable on your Chevelle with TH400 automatic transmission and horseshoe style shifter. Hand Controls for the Disabled Fits most classic and modern car, trucks! 1964 - 1977 Chevelle Package Tray + Insulation Set Many Years / Styles / Colors!